If you don't already know, the presentation for this season will be held in the NAGS HEAD, 16th June. I saw Browner, today, so I need to state: " UPLYME FC ARE NOT TO BE HELD ACCOUNTABLE IF PEOPLE WANT TO TURN UP, SNIFF A GLASS OF CHAMPAGNE, THEN PROMPTLY FALL OVER, BREAKING ANY BONES"
Anyway, it should be a super evening; please come along and meet the lads. Posted: 18/06/07, 07:58 Post subject: Presentation details. 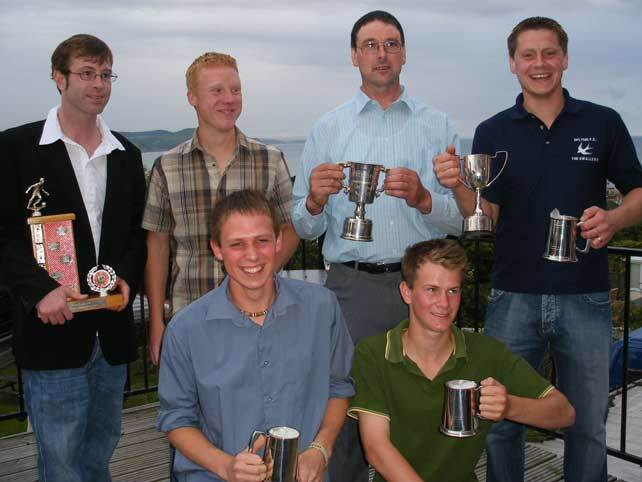 Uplyme football Club held their annual presentation night at the Nags Head on Saturday night. Chairman Mr. Gavin Fowler welcomed the players and supporters. He thanked Debbie and Rob Hammon for their sponsorship and for providing food for them after every game. On a personal note, he felt one of the highlights of the year was the charity game with past and present players in memory of former manager/chaiman Mr. Frank Bowditch - we raised �450 for Cancer Research, and our thoughts are once again with the Bowditch family at this difficult time. He thought religation from Division One was harsh, as we worked well, we only lost by 1 or 2 goals and we gave the opposition a tough match, but it`s happened, we must learn from it, and bounce back! Gavin also thanked Mr. Geoff Browne at www.uplyme.com for his wonderful website. This allowed the Club to post information, photos and news worldwide, as well as amusing certain players who seem to think they are Alan Hansen and Mark Lawrenson. Managers Roger Smart and Andy Cleere presented the Trophy for Players Player to James Bedows for his enthuisiam and continued hard work. Gavin received Managers Player for being the only player to play every game, giving 100% maintaining the pitch at Venlake Meadow and having clean kit!! Joel Seward received Young Player of the Year from Uplymes oldest player/manager Mr. Phil Hodder. Phil paid tribute to Joel and wished he could run as fast! Jim Preston received Clubman of the Year - he turns up for every game and never complains if hes on the subs bench and doesn`t get a game. Committees Player went to Pip Marchant for his hard work and leadership in defence. Lloyd Cleal received the award for Most Improved Player. Lloyd joined Uplyme this season from Lyme Regis and said hes never had so much fun playing footbaqll. Lastly Gavin received Top Goal Scorer for the 9th season. Presenting the trophy former manager Mr. Tony Squire paid tribute to Gavin's hard work and felt his goal of the season was the 35 yard volley at Hinton.